What DX level does my graphics card support? Does it go to 11? Recently I run into a situation that I have run into quite a few times. Someone encounters a machine and the question arises: "Is there a DirectX 11 card in this machine?". Typically the reason you are interested in that is because cards with DirectX 11 drivers fully support DirectCompute (and by extension C++ AMP) for GPGPU programming. The driver specifically is WDDM (1.1 on Windows 7 and Windows 8 introduces WDDM 1.2 with cool new capabilities). There are many ways for figuring out if you have a DirectX11 card, so here are the approaches that you can use, with a bonus right at the end of the post. WindowsKey + R, type DxDiag and hit Enter. That is the DirectX diagnostic tool, which unfortunately, only tells you on the "System" tab what is the highest version of DirectX installed on your machine. So if it reports DirectX 11, that doesn't mean you have a DX11 driver! The "Display" tab has a promising "DDI version" label, but unfortunately that doesn't seem to be accurate on the machines I've tested it with (or I may be misinterpreting its use). Either way, this tool is not the one you want for this purpose, although it is good for telling you the WDDM version among other things. There is a Microsoft Windows 7 compatibility center, that lists all hardware (tip: use the advanced search) and you could try and locate your device there… good luck. Use the Wikipedia page for the vendor cards, for both nvidia and amd. Often this information will also be in the specifications for the cards on the IHV site, but is is nice that wikipedia has a single page per vendor that you can search etc. There is a column in the tables for API support where you can see the DirectX version. You may not have a DirectX 11 card and are interested in purchasing one. While I am in no position to make recommendations, I will list here some cards from two big IHVs that we know are DirectX 11 capable. Download and install the June 2010 DirectX SDK. As part of that you now have the DirectX Capabilities Viewer utility (find it in your start menu by searching for "DirectX Caps Viewer", the filename is DXCapsViewer.exe). It will list all your devices (emulated, and real hardware ones) under the first node. Expand the hardware entries and then expand again the Direct3D 11 folder. If you see D3D_FEATURE_LEVEL_11_ under that, then your card supports feature level 11 which means it supports DirectCompute and C++ AMP. In the following screenshot of one of my old laptops, the card only goes to feature level 10. Run a utility from the web that just tells you! Of course, writing some C++ AMP code that enumerates accelerators and lists the ones that are capable is trivial. However that requires that you have redistributed the runtime, so a more broadly applicable approach is to use the DX APIs directly to enumerate the DX11 capable cards. 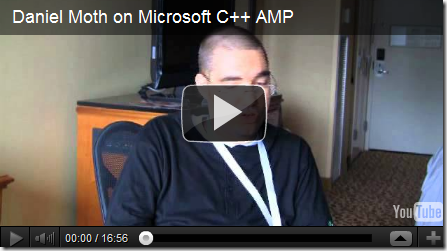 That is exactly what the development lead for C++ AMP has done and he describes and shares that utility at this post.